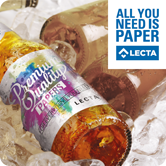 Lecta, a European leader in the manufacturing and distribution of specialty papers for labels and flexible packaging, will aga​in participate in the BrauBeviale trade show. This year’s event expects to gather over 1,000 exhibitors and 37,000 industry professionals. It will feature the latest developments and trends in raw materials, equipment, technologies, logistics and marketing for beer, water and other beverages. - Metalvac E HWS: high moisture resistance wet-glue labels for returnable bottles, especially for beer, water and spirits. - Metalvac E LWS: light moisture resistance wet-glue labels for one-way beer bottles​ and plastic beverage containers. - Metalvac A HG: metallized paper for pressure-sensitive eye-catching labels with a high gloss finish. The Metalvac range is available in plain or embossed (pin-head, brushed and linen) finishes. “Endless possibilities” is the swatchbook for Lecta’s Creaset one-side coated paper line, designed for the labels and flexible packaging segment. Its range of products for beverage labels includes high wet-strength Creaset HWS papers (available with smooth and embossed linen finishes), ideal for beer labels, and light wet-strength Creaset LWS papers for beverage and water bottles. Creaset LWS and Creaset HWS are available with fungistatic treatment for applications that require a barrier against the spread of fungi. Our Adestor self-adhesive products from the “Labels to Celebrate” collection allow for elegant product decoration on wine, cava, spirits, beer and water bottles. Different combinations of paper and film facestock, as well as water-based acrylic adhesives, are included in this product range featuring facestock such as the gloss pearl finish Adestor Glitter WS, with anti-moisture and anti-mildew treatment perfect for cavas and champagne, and the moisture-resistant Adestor Embossed Martele WS, with an embossed white martele finish, suitable for wines and spirits. The recommended adhesives for these applications are the standard A251 permanent adhesive for bottles stored in a dry place and the BC361 Plus permanent adhesive, designed especially for glass recipients subject to ice-bucket immersion (ice-test resistance). For more information about Lecta’s range of specialty papers, please visit www.lecta.com​ and www.adestor.com. We look forward to seeing you at BrauBeviale 2016, Hall 4, Stand 438, November 8-10.